JEANETTE JONES-DREAMS ALL COME TRUE. The history of soul music is littered with artists who could’ve and should’ve gone on to greater things, but for whatever reason, commercial success and critical acclaim passed them by. That, sadly, was the case with Jeanette Jones. She had talent in abundance, and a voice that was a mixture of power, passion, emotion and sheer soulfulness. Sadly, Jeanette Jones’ recording career was all too brief, and amounts to just one single, Darling, I’m Standing By You. It was released on the Golden Soul label in 1969, and the two years later, was reissued by Kent. Nothing came of the single. Jeanette Jones’ last recording session was in 1974, when she recorded a publishing demo for Barry Goldberg. Sadly, that was the last time she entered a recording studio. It was also the end of Jeanette Jones’ musical career. For Jeanette Jones, the dream was over. Since then, Jeanette Jones has remained an enigmatic and mysterious figure. Very little is known of her life pre and post music. Nowadays, it is thought that Jeanette Jones lives quietly in San Francisco. That was where the twenty songs on Playback Records’ new Jeanette Jones compilation Dreams All Come True was recorded. Dreams All Come True is the most compressive overview of her career, and covers the times she spent with The Mill Valley Bunch, The Voices Of Victory Choir and her solo carer. These twenty songs document the Jeanette Jones’ musical career. Details of Jeanette Jones’ early life are somewhat sketchy. It’s thought that she was born and brought up in San Francisco. That was certainly where Jeanette Jones first discovered music. Just like many future soul singers, Jeanette Jones first started singing in church. That proved to be Jeanette Jones’ gateway into music. However, it was with the Voices Of Victory gospel choir that Jeanette Jones’ first came to prominence. Cora Wilson had formed The Voices Of Victory gospel choir in 1962. Hers was no ordinary choir though. The Voices of Victory gospel choir featured sixty singers, who travelled the West Coast in their own bus. They sang in churches and at gospel conventions. It was an impressive sight and sound. Especially when the soloists enjoyed their moment in the spotlight. By 1965, one of the soloists was Jeanette Jones. She was the owner of an impressive and powerful voice. When Jeanette Jones stepped into the spotlight, she combined, power, passion and emotion. Given the her vocal prowess, it was no surprise that Jeanette Jones was one of the stars of The Voices Of Victory gospel choir. Everyone who heard them realised this. So too would Leo Kulka at Golden State Recorders. Leo Kulka first encountered Jeanette Jones in November 1965. Cara Wilson had booked Golden State Recorders to record an album by The Voices Of Victory gospel choir. Given the size of the choir, Leo Kulka decided to use Golden State Recorders’ larger studio in Harrison Street. After the recording session, Cara Wilson planned to have a limited number of albums pressed, and they would be sold after concerts. In a way, Cara Wilson was just testing the water, to see if there was a market for albums featuring her choir. Soon, Leo Kulka realised that Cara Wilson was underselling her choir. As the recording session got underway, Leo Kulka immediately realised just how good The Voices Of Victory gospel choir were. Cara Wilson’s choir wasn’t just one of the best in the state, but one of the best on the West Coast. Music this good deserved to be heard by a much wider audience. Especially as they recorded through He’ll Understand, Lord I’ll Go, There Is No Failure In God, Lord I’ll Cry Out and There Is A Fountain which feature on the Dreams All Come True compilation. So does Why which features Jeanette Jones on lead vocal. When Leo Kulka heard Jeanette Jones’ lead vocal on Why, her voice stopped Leo Kulka in his tracks. It was a cut above the rest of the soloists. Jeanette Jones was capable of singing with power, but was always in control as she delivered the lyrics with emotion and sincerity. From the moment Leo Kulka heard Jeanette Jones sing, he promised himself he was going to sign her. So once the recording session was over, Leo Kulka approached Jeanette Jones, with a view to signing her. Jeanette Jones wasn’t interested in signing a recording contract. She had no intention in crossing over, and instead, wanted to continue to do what she saw as the “Lord’s work” with The Voices Of Victory gospel choir. This must have come as a surprise to Leo Kulka. Back in 1965, most singers, including gospel singers, dreamt of signing a recording contract. Even if this meant crossing over from gospel to secular music. Jeanette Jones it appeared was the exception. That was until late 1967. It wasn’t until late 1967, that Leo Kulka next encountered Jeanette Jones. By then, things had changed for Jeanette Jones. Not only had she crossed over, and was singing secular music, but she also had acquired a manager, Jay Barrett. He didn’t come from a musical background. Instead, he was a banker who was based in Palo Alto. Although a relative newcomer to the music industry, Jay Barrett wasn’t content to be a manager, he also dreamt of forging a career as a songwriter. Jeanette Jones he hoped would go on to record some of these songs. So he went away to work on a proposal. By then, Jeanette Jones had signed to Leo Kulka’s Golden Soul label. Leo Kulka was vastly experienced, and would be able to guide Jeanette Jones through the early stages of her recording career. Soon, though, Soon, Jay Barrett came up with a proposal. It stated that if Jeanette Jones was willing to record Jay Barrett’s songs, then he was willing to part finance the recording of a demo. This would be recorded Leo Kulka’s Golden State Recorders. Leo Kulka agreed to this, and began preparing for his first session with Jeanette Jones. The recording session was scheduled to take place in February 1968. No expense was spared, and Leo Kulka began to put together an extensive backing band. There was a problem though. The songs that Jay Barrett had written were unsuited to Jeanette Jones in their present form. They were poppy, and sounded like a remnant from earlier in the sixties. Soon, though, Leo Kulka had worked out a solution,..backing vocalists. So Leo Kulka put in a call to Ramona King and her brother Cleo. Ramona King’s career began in 1962, when she signed to Eden Records. Since then, she had spent time at Warner Bros. Records, Amy and most recently, Action Records. Leo Kulka explained that he needed backing vocalists to accompany Jeanette Jones and help her add some much-needed soulfulness to Jay Barrett’s songs. The Kings agreed, and when the recording sessions began, found themselves at Golden State Recorders. At that first recording session, Jeanette Jones recorded a couple of Jay Barrett songs, Jealous Moon and Quittin’ The Blues. With the large ensemble accompanying her, the two songs were soon in the can, They were produced by Leo Kulka, with Jay Barrett receiving a co-production credit. The next step, was to try to interest another label in the songs. Leo Kulka began shopping Jealous Moon and Quittin’ The Blues to various labels. However, none of the labels expressed an interest in releasing the songs. For Leo Kulka, this was a huge disappointment. So he dug deep into his contact book. The man he decided to consult was Larry Goldberg, an independent producer based in Los Angeles. Larry Goldberg was part talent scout, part producer. Part of his time was spent finding and developing artists. Other times, he shopped his artists to major labels. Just like Leo Kulka, Larry Goldberg was vasty experienced. He also thought he might have the answer to Leo Kulka’s problem. The answer Larry Goldberg thought, might lie in three backing tracks. This included the Ben Raleigh penned Break Someone Else’s Heart. Another possibility was Andy Badale and Albert Elias’ I Want Action, which had recently given Ruby Winters a hit. The third and final songs was Sam Russell’s Cut Loose, which had been arranged by H.B. Barnum. Having listened to the three pop soul cuts, Leo Kulka agreed that they had the potential to solve his problem. So he gave Jeanette Jones a call, and she made her way to Golden State Recorders. Although Jeanette Jones was signed to Leo Kulka’s Golden Soul label, she was still singing with the Voices Of Victory gospel choir. Maybe she was keeping her options open, given the life of a professional singer could sometimes, be perilous? Careers were often short, and could be, unpredictable and unprofitable. Jeanette Jones must have realised this after her first recording session. Now was time to try once again. Having listened to the trio of backing tracks, Jeanette Jones set about laying down vocals. She combined power and emotion, delivering an almost defiant vocal on Break Someone Else’s Heart. Then on Cut Loose, Jeanette Jones delivers a vocal tour de force, as horns and harmonies accompany her vocal on this stomper. On the final song, I Want Action Jeanette Jones again combines power and emotion as she delivers a needy, hopeful vocal. Once the vocals were recorded, Jeanette Jones had done her part. Now it was over to Leo Kulka. His job was to shop the songs to various labels. Given the quality of the songs, Leo Kulka must have been confident of securing a deal for Jeanette Jones. Despite his best efforts, none of the labels he approached were interested in releasing the songs. Lightning had struck twice for Jeanette Jones. She returned to the Voices Of Victory gospel choir. By the spring of 1969, Jeanette Jones was now fronting the Voices Of Victory gospel choir. They were still one of the biggest and most successful gospel choirs on the West Coast. Despite this, Jeanette Jones returned to Golden State Recorders. Still Jeanette Jones hadn’t given up on her dream of making a career out soul music. So she headed to Golden State Recorders. That was where she first encountered singer-songwriter Wally Cox. Leo Kulka had asked him to write a song that would showcase Jeanette Jones’ conferable vocal talents. He delivered a trio of songs, including Darling, I’m Standing By You. It was tailor-made for Jeanette Jones. At Golden State Recorders, Jeanette Jones prepared to record Darling, I’m Standing By You. With Leo Kulka producing, Jeanette Jones delivered a spine-tingling, soul-baring, testifying vocal. Backing vocalists accompany her every step of the way, as Jeanette Jones combines gospel and soul, on what was a career defining moment. Meanwhile, Wally Cox went away and wrote two new songs. The Thought Of You was a beautiful mid-tempo ballad, that again, seemed tailor-made for Jeanette Jones. She’s in a reflective mood, as she gives thanks for the love she’s found. Unlike some of the soul being released in 1969, it had a much more modern, contemporary sound. Wally Cox’s other composition was I’m Glad I Got Over You, which features a defiant Jeanette Jones as she delivers another vocal powerhouse against an urgent, driving arrangement. It’s another song with a much more contemporary sound, that could’ve and should’ve transformed Jeanette Jones’ career. Leo Kulka realised this. So much so, that he was willing to release Darling, I’m Standing By You and The Thought Of You on his own record label, Golden Soul. Leo Kulka hoped that the local R&B and gospel and radio stations would pickup on the single. This Leo Kulka hoped, would result in him being able to cut a distribution deal with a major label. That was the plan. Leo Kulka had 1,000 copies of Darling, I’m Standing By You and The Thought Of You pressed. These copies he hoped would sell out, and the single would be picked up radio stations in the San Francisco area. However, the 1,000 copies of Darling, I’m Standing By You failed to sell, and Leo Kulka was back to square one. While many people would’ve called it a day, Leo Kulka decided to use the single to shop Darling, I’m Standing By You to major labels. He took the single to Atlantic, but they turned the song down. Motown then passed on Darling, I’m Standing By You. Things weren’t looking good for Darling, I’m Standing By You, and Jeanette Jones’ career. She had been trying to make a breakthrough since 1967, and was no nearer to doing so. Things however changed in 1971, when the Bihari brother agreed to release some of Leo Kulka’s releases on their Kent Records and Modern Records’ labels. One of the singles they chose to release was Jeanette Jones’ Darling, I’m Standing By You. Maybe, Jeanette Jones’ luck was changing? Alas it wasn’t to be. Darling, I’m Standing By You failed commercially, and quickly, the single disappeared without trace. For Leo Kulka and Jeanette Jones it was a frustrating time. The single, Leo Kulka felt, hadn’t received sufficient promotion by Modern Records. So it was no surprise when it failed for commercially. By then, Jeanette Jones was beginning to rethink her future. Following the commercial failure of Darling, I’m Standing By You, Jeanette Jones started to work as a session singer. She also worked with Mike Bloomfield on his Mill Valley Bunch project. Jeanette Jones takes the lead on the soul-baring ballad What Would I Do Without My Baby and unleashes a vocal powerhouse on Ooh Ooh Ooh, La, La, La which has been remixed. Both songs feature on the Mill Valley Bunch’s one and only album, Casting Pearls, which was released on Verve Records in 1972. Soon, though, Jeanette Jones began to look beyond music. Jeanette Jones began to do some voiceover work, and was chosen as the voice of the Swiss Colony Wine radio campaign. It was also around this time, that Jeanette Jones began to do some modelling. This kept her busy, and gradually, Jeanette Jones seemed to lose interest in music. Indeed, she only returned to Golden State Recorders one more time. This was in 1974, when Jeanette Jones headed to Golden State Recorders to record a publishing demo for Barry Goldberg, who a friend of both Mike Bloomfield and Leo Kulka. During that last session, Jeanette Jones cut two tracks penned by Gerry Goffin and Barry Goldberg. The first was You’d Be Good For Me a pulsating slice of uber funky music. Very different was What Have You Got To Gain By Losing Me? It’s a truly beautiful, heart wrenching ballad that showcased Jeanette Jones’ ability to breath life, meaning and emotion into a song. Sadly, after the publishing demo for Barry Goldberg, Jeanette Jones turned her back on music. Jeanette Jones was a hugely talented singer, who had the ability to breath life, meaning and emotion into lyrics. She could combine power and passion, and seamlessly switch between ballads and uptempo tracks. Despite her undoubted talent, sadly, Jeanette Jones never made a breakthrough. It was a case of what might have been. That is despite Leo Kulka championing Jeanette Jones. He produced her, and then shopped the songs to bigger labels. Sadly, only once did a single get picked up by a bigger record, Darling, I’m Standing By You. Even when that happened in 1971, Modern Records didn’t promote the single sufficiently. Maybe this led to Jones considering her future? After four years struggling to make a breakthrough, maybe reality kicked in and Jeanette Jones realised that not all dreams come true? It was certainly around this time that Jeanette Jones began to work as a session singer. After this, the only time Jeanette Jones returned to a recording studio was to record a publishing demo for Barry Goldberg, Ironically, during that session, Jeanette Jones recorded one of her finest songs What Have You Got To Gain By Losing Me? It’s a poignant reminder of Jeanette Jones, and features on Dreams All Come True, which was recently by Playback Records. 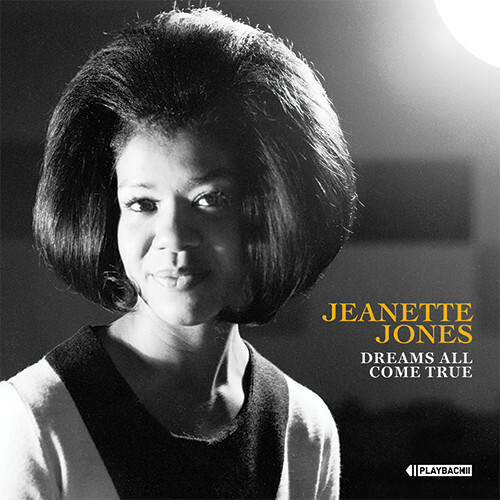 Dreams All Come True is the most comprehensive overview of Jeanette Jones’ career and the perfect introduction to her music. The twenty tracks on Dreams All Come True, also document what was a case of what might have been. Maybe by the time she changed her mind in 1967, it was too late? Music was changing, and changing fast. Suddenly the musical landscape was totally different. By 1967, pop and rock dominated the musical landscape, and the psychedelic revolution was well underway. While soul was still popular, it was nowhere near as popular as pop or rock. Some soul labels, including Stax and Motown were still releasing hit singles by 1967 and would continue to do until over the next four years. Meanwhile, Atlantic Records’ ‘soul years had finished in 1967, but the label had just released Aretha Franklin’s Atlantic Records’ debut I Never Loved a Man the Way I Love You in 1967. This was the start of Aretha Franklin’s Atlantic Records years, which was the most successful period of her career. Sadly, many other talented soul singers struggled to make a breakthrough during this period. This included Jeanette Jones. Despite her undeniable talent, and her ability to breath life and meaning into a song, commercial success eluded Jeanette Jones.The question is why? Maybe if Leo Kulka had managed to interest a major label in Jeanette Jones, things would’ve been very different? However, there is also the possibility that Jeanette Jones was neither driven nor determined enough to make a career out of music. It could be that Jeanette Jones wasn’t comfortable singing secular music, given her background in gospel music? There’s any number of reasons why commercial success eluded Jeanette Jones. Deep down, maybe Jeanette Jones knew that enjoying a successful career as a soul singer was a long shot, and very few succeeded? That is doubtful, and if it that was the case, it would be ironic, as Jeanette Jones had what it took to enjoy a long and successful career in music. Dreams All Come True is proof of this, and is a reminder of Jeanette Jones who could’ve, and should’ve, gone on to greater things. Sadly, commercial success and critical acclaim passed Jeanette Jones by who is proof that not All Dreams All Come True. ← VASHTI BUNYAN-THE QUEEN OF PSYCH FOLK.